Composable Nomination Classic Gold and Enamel Madame & Monsieur – Monsieur Charm, a stainless steel base link with 18ct Gold. 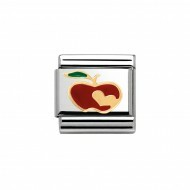 Composable Nomination Classic Gold and Enamel Madame & Monsieur Apple With Heart Charm, a stainless steel base link with 18ct Gold. 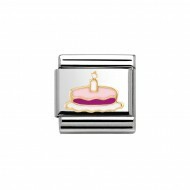 Composable Nomination Classic Gold and Enamel Madame & Monsieur Cake With Candle Charm, a stainless steel base link with 18ct Gold. Composable Nomination Classic Gold and Enamel Madame & Monsieur Cherry Cake Charm, a stainless steel base link with 18ct Gold. Composable Nomination Classic Gold and Enamel Madame & Monsieur Cookie Heart Charm, a stainless steel base link with 18ct Gold. 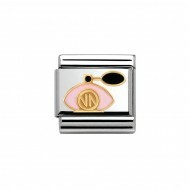 Composable Nomination Classic Gold and Enamel Madame & Monsieur Cookies In Heart Charm, a stainless steel base link with 18ct Gold. Composable Nomination Classic Gold and Enamel Madame & Monsieur Cup With Heart Charm, a stainless steel base link with 18ct Gold. Composable Nomination Classic Gold and Enamel Madame & Monsieur Gingerbread Man Charm, a stainless steel base link with 18ct Gold. Composable Nomination Classic Gold and Enamel Madame & Monsieur Gingerbread Woman Charm, a stainless steel base link with 18ct Gold. 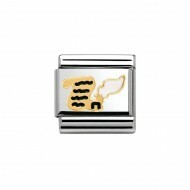 Composable Nomination Classic Gold and Enamel Madame & Monsieur Letter And Inkwell Charm, a stainless steel base link with 18ct Gold. Composable Nomination Classic Gold and Enamel Madame & Monsieur Lollipop Heart Charm, a stainless steel base link with 18ct Gold. 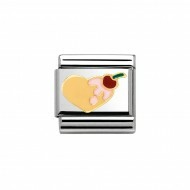 Composable Nomination Classic Gold and Enamel Madame & Monsieur Madame Charm, a stainless steel base link with 18ct Gold. 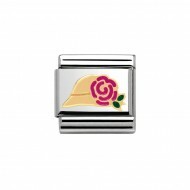 Composable Nomination Classic Gold and Enamel Madame & Monsieur Madame Hat Charm, a stainless steel base link with 18ct Gold. Composable Nomination Classic Gold and Enamel Madame & Monsieur Madame Perfume Charm, a stainless steel base link with 18ct Gold. Composable Nomination Classic Gold and Enamel Madame & Monsieur Madame Phone Charm, a stainless steel base link with 18ct Gold. Composable Nomination Classic Gold and Enamel Madame & Monsieur Madame Shoes Charm, a stainless steel base link with 18ct Gold. Composable Nomination Classic Gold and Enamel Madame & Monsieur Moustache Charm, a stainless steel base link with 18ct Gold. 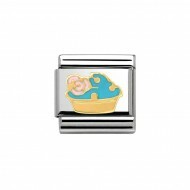 Composable Nomination Classic Gold and Enamel Madame & Monsieur Muffin With Flowers Charm, a stainless steel base link with 18ct Gold. 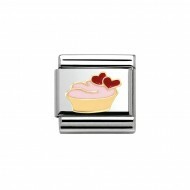 Composable Nomination Classic Gold and Enamel Madame & Monsieur Muffin With Hearts Charm, a stainless steel base link with 18ct Gold. 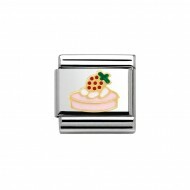 Composable Nomination Classic Gold and Enamel Madame & Monsieur Trick Strawberry Charm, a stainless steel base link with 18ct Gold. Composable Nomination Classic Gold and Enamel Madame & Monsieur Walking Umberella Charm, a stainless steel base link with 18ct Gold. Composable Nomination Classic Gold Madame & Monsieur Apple With Heart Charm, a stainless steel base link with 18ct Gold. Composable Nomination Classic Gold Madame & Monsieur Classic Cherry Cake Charm, a stainless steel base link with 18ct Gold. Composable Nomination Classic Gold Madame & Monsieur Cookie Heart Charm, a stainless steel base link with 18ct Gold. Composable Nomination Classic Gold Madame & Monsieur Lollipop Heart Charm, a stainless steel base link with 18ct Gold. Composable Nomination Classic Gold Madame & Monsieur Madame Hat Charm, a stainless steel base link with 18ct Gold. Composable Nomination Classic Gold Madame & Monsieur Moustache Charm, a stainless steel base link with 18ct Gold. Composable Nomination Classic Gold Madame & Monsieur Muffin With Flowers Charm, a stainless steel base link with 18ct Gold. Composable Nomination Classic Gold Madame & Monsieur Muffin With Hearts Charm, a stainless steel base link with 18ct Gold. 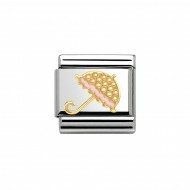 Composable Nomination Classic Gold Madame & Monsieur Walking Umbrella Charm, a stainless steel base link with 18ct Gold.